The Alkincoats Cross in Colne Public Library. OS grid reference: SD 8789 4094. The Alkincoats Cross or Colne Cross is a small section of an Anglo-Norse cross-head now located in Colne Library on Market Street. It was dug up in the grounds of Alkincoats Hall, a building that was built sometime after 1540 and was the home of the Parker family of Browsholme. The hall was demolished in 1958. Today all that remains of the hall is Alkincoats farm at the north-side of the large park, close to Red Lane, which is named after the old hall. But it seems there was a 12th-13th century religious building and maybe a chapel belonging to the Knights Hospitallers on the site; they had been given the land by John de Lacy (Dixon, John, 1990). But before that there may have been a late Saxon settlement of some kind. The cross-head section is one of three found in the colne area in the late 19th early 20th century. It has carvings that are similar to the decoration found on the Whalley Crosses, and so it must date from the 10th-11th century AD and be a pre-Conquest cross fragment. 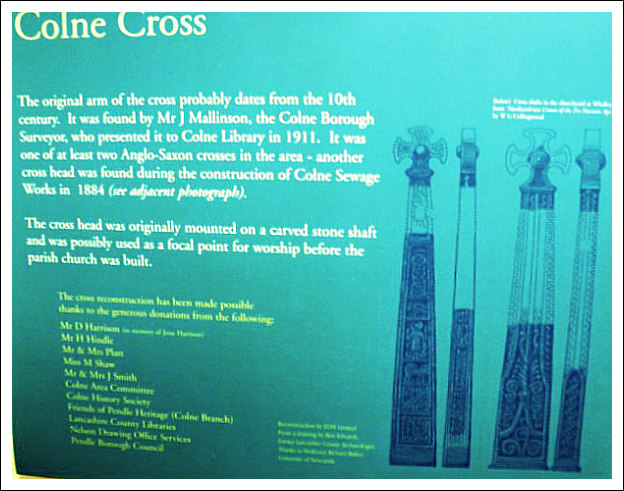 A History of The Colne Cross at Colne Library. The cross-head fragment was dug up from the garden of Alkincoats Hall in the early 1900s having been buried for well over 450 years, probably to avoid it being smashed at the Reformation, or more likely it was already broken up and thrown down to the ground where it was lost. 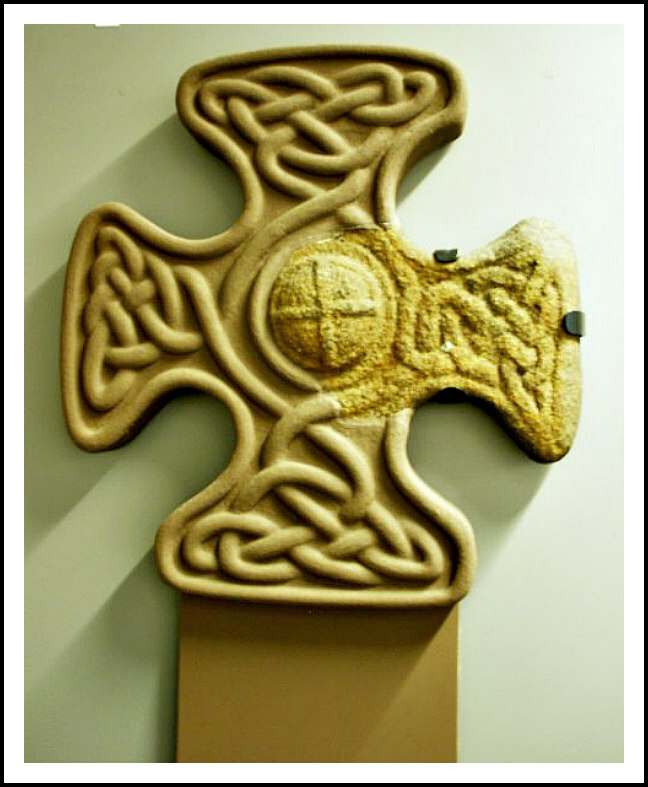 It is an arm section from an Anglo-Norse cross-head and is decorated with knot-work interlacing that is often described as being Celtic in origin, and in the middle there is a small raised boss with a tiny, thin cross in its centre. The rest is a very good reconstruction. It was presented to Colne public library in 1911 by the then Borough Surveyor, but may have stood in Colne parish church at some point. When the cross was whole it would have been quite a tall preaching cross and probably stood at Alkincoats (Alcancotes) – where the local Christian community and probably pilgrims from further afield could congregate on saints’ feast-days and other church festivals – prior to the building of St Bartholomew’s parish church, in Colne. Clayton, John A., The Valley Of The Drawn Sword, Barrowford Press, Lancashire, 2006. Categories: Ancient Crosses | Tags: The Alkincoats Cross at Colne in Lancashire, The Colne Cross in Lancashire | Permalink.